Welcome to our article on the Top Caribbean All Inclusive Resorts for Easter. Once a year, usually during the first months of the year, travelers starting looking for good vacation options. While they may look our the window and see snow falling, they will envision the day of visiting tropical vacations to sit back, relax and enjoy the warm, inviting weather. Just imagine your choice of fun water activities, a variation of dining options and what type of view your suite will offer. If you’re looking for some fantastic vacation ideas, take a look at our list of the best Caribbean all inclusive resorts for Easter. 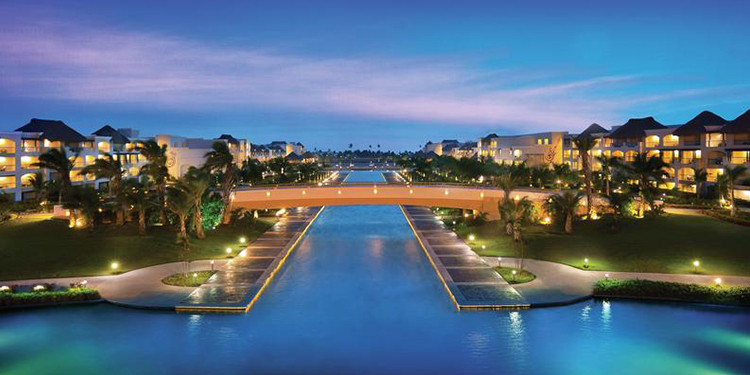 Starting off our list is The Grand Palladium Lady Hamilton Resort & Spa. You will find this breathtaking beachfront location off the north coast of Jamaica which features a very modern design. There are a wide variety of options included in the price. If you’re looking to eat, be sure to take advantage of the seven a la carte restaurants that include a wide variety of cuisine or the three buffet restaurants. If you prefer to drink: You can discover 16 bars distributed throughout the resort. Try your luck with any number of the slot machines on location. If you want to get wet, you have a choice of five pools or take to the beach and enjoy water sports such as kayaking, snorkeling, and deep sea fishing. Sunset is located at the Palms is on the northern side of Negril, amongst gorgeous tropical gardens and flowering plants. This luxury destination has been named one of the top ten most romantic and best all-inclusive resorts in the Caribbean by TripAdvisor. Find a variety of things to do, from non-motorized water sports including kayaking snorkeling and wind surfing. You will also find traditional Jamaican cooking classes and bartending classes. There are so many food choices here too, all meals come with a choice of buffet dining, beach grill with a la carte restaurants included. You’ll find an affordable vacation choice at Grand Pineapple; which is why it makes the list of our Caribbean all inclusive resorts for Easter. Set on a central location right on Negril’s Seven Mile Beach, this spot features colorful cottages with find plenty of water sports to do. Snorkel, sail, kayak and windsurf to your heart’s content or do a few laps in the freshwater pool. Explore their dining experience and sample authentic Caribbean cruise or take advantage of the incredible buffet spreads. You’ll never go thirsty with the fruit-filled tropical creations and sophisticated cocktails at this location. 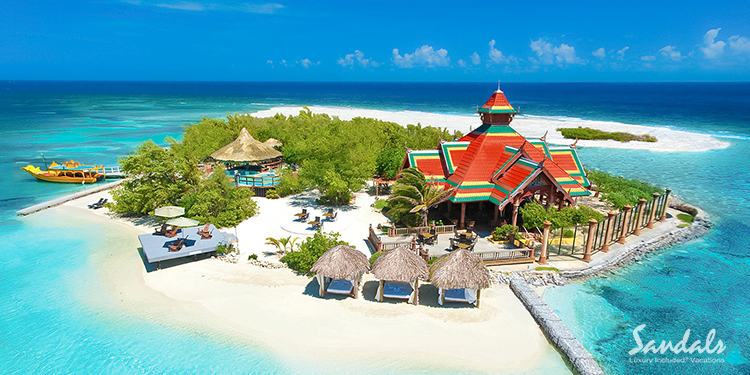 Vacationers can also enjoy activities at nearby Sandals and Beaches resorts for an additional fee. The Riu Palace Bavaro Hotel is located on Arena Gorda beach, a perfect spot for a family holiday, romantic getaway, or trip with friends. They have developed a complete program of activities to make sure all its guests have fun. The live music and shows, the RiuLand Kids’ Club and the discotheque guarantee you a fun-filled stay. Chose from any of the three outdoor pools or get free admission to the nearby Splash Water World. Dining options are plentiful, with buffet, Japanese, Italian, Krystal Fusion and Grill Steakhouse available. Fronting a pristine, white-sand beach and the turquoise waters of the Caribbean, sits Lighthouse Pointe at Grand Lucayan. It is the perfect solution for travelers craving features galore in just one location. Find fun-filled gaming action at the casino, take a swim in the sparkling pool or sharpen your skills at any of the tennis courts; featuring four different surfaces, including grass. A golf course is located within minutes of the hotel that features an 18-hole, par-72 championship course. Their restaurants will cater to your every culinary whim with classic Bahamian fare like conch fritters to an array of international cuisine. Set on a private stretch of Dover Beach on Barbados’ southwest coast, Sandals Barbados sits on a stretch of beautiful white-sand beach. Highlight include 10 acres of gorgeous tropical gardens and Sandals first ever Indian restaurant. Take advantage of fine dining at 11 world‐class restaurants at this resort or take a trip next door to Sandals Royal Barbados where six more restaurants are waiting to cater to your culinary cravings. Take a seat and let the party begin with top-shelf drinks included 24/7 and served everywhere thorough the location. You are going to love the swim-up suites which leads to the largest river pool in the Caribbean. Be sure to take advantage of the unlimited land and water sports which include scuba diving in the clearest turquoise waters in the world. A soft white-sand beach slopes down to a sheltered bay where you will find Dreams Puerto Aventuras Resort & Spa. Nearly everything is included at this seaside getaway where you will find something for every age and interest. Swim or kayak with with lovable dolphins and manatees at Dolphin Dreams. During the months of July through December, take a peak of the sea turtles who hatch seasonally. Explore an international array of specialty restaurants where reservations are never required. Choose between five à la carte restaurants, a buffet, a grill and a café. Find wide selections of international and domestic top-shelf spirits, fine wines and ice-cold beer at any of the four bars and lounges. This is a wise pick on our list of the top Caribbean all inclusive resorts for Easter. Perfectly situated along a long stretch of an uncrowded white-sand beach on the easternmost coast of the Dominican Republic, lies Zoetry Agua Punta Cana. It offers the finest in gourmet dining at four divine internationally-flavored restaurants including a café. It features a variety of options with assortments of organic food. Choose from an array of cocktails at the swim up wet bar. Activities are abundant here which includes a long pristine pool, yoga, snorkeling, cigar rolling or tee off at a number of championship golf courses, all located nearby. Highlights of the hotel include complimentary 45-minute horseback rides and complimentary 20-minute massages. 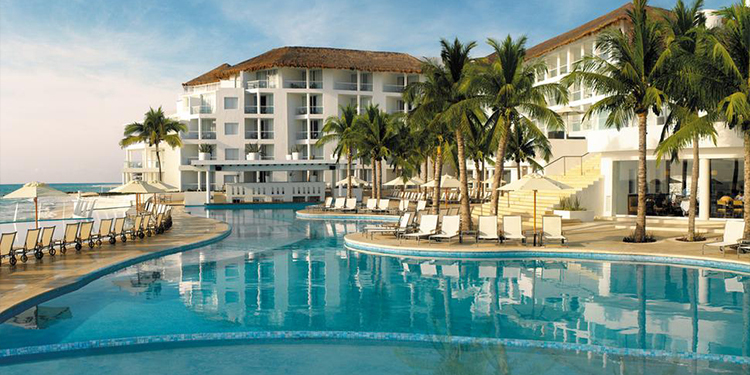 Located in the heart of Playa del Carmen with tranquil turquoise waters and powdery white sands, sits Playacar Palace. Experience the utmost in luxury with in-room double whirlpool tubs. The destination features three dining options from comfort food, to international fine cuisine. Playacar Palace offers plenty to do including an unforgettable experience swimming with trained dolphins. Activities include beach volleyball, bicycle tours or work on your backhand at the tennis court. Sit back and enjoy the nightly shows which feature a magic show, a dance evolution show, circus shows or the Tenors show where trained opera singers recreate the three tenor musical extravaganza. The oldest continually operating hotel in the Caribbean, The Crane Residential has been operating since 1887 and features 19th-century-style room. Take a dip in any of it’s three pools including an adult only historic pool, private pools and a cascading pool complex. Find fun-filled activities like playing a game of tennis in it’s two flood-lit courts, get physical in the fitness center or take some Yoga and Zumba classes. Be sure to take advantage of the five award wining restaurants and bars. From the Old World tastes of Southern Italy to the delicacies of Japan and Thailand, explore a world of epicurean delights right on-site. Voted the “World’s Most Romantic Resort” year after year, Sandals Grande Antigua is located on Antigua’s best and most famous beach, Dickenson Bay. This couples only getaway features 27 acres of meticulously groomed gardens, fantastic for unwinding. Find unlimited fine dining at eleven world‐class restaurants with choices from heart‐warming Italian cuisine and fiery island dishes. Pick from any of the six pools, which includes Eastern Caribbean’s largest or six whirlpools to wind down in. This is Sandals after-all; so you should expect it on our list of the top Caribbean all inclusive resorts for Easter. Fun activities include unlimited land and water sports which include; scuba diving, sailboating, windsurfing, paddleboarding, hydrobiking and so much more! 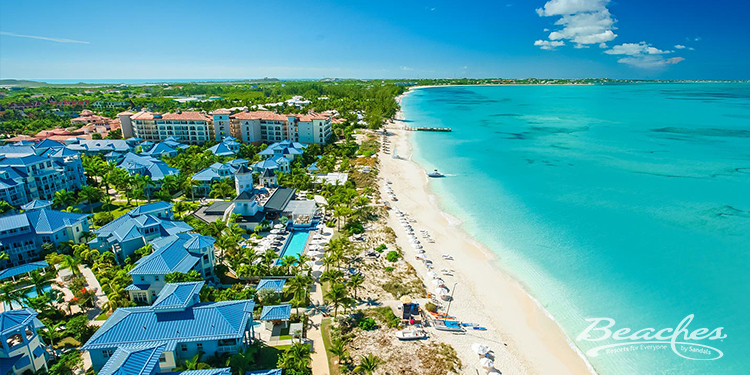 An easy entry on our top Caribbean all inclusive resorts for Easter, is Beaches Turks and Caicos. Boasting the largest resort in Turks & Caicos, this Beaches location is supreme, spanning a sprawling 65-acres. Here you will discover five villages in one resort including, Caribbean & Seaside, Italian, Key West and a French Village to spark your interest. Find plenty of endless fun on this 12-mile beach lapped by clear turquoise waters. Included in your price, is the Pirate Island Waterpark where you be wowed by gigantic waterslides, kid-friendly pools and swim-up soda bars. Whether your new to scuba diving or an expert, take part in their diving program, which is all included. 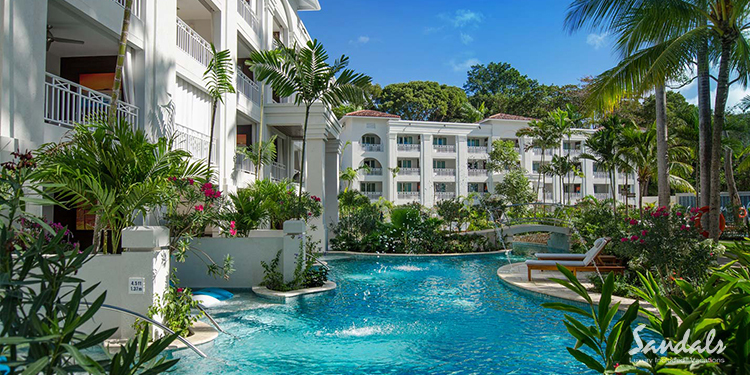 If that isn’t enough, swim in any of the 6 pools, 3 include swim-up bars. There’s something for every taste at any of the 21 gourmet restaurants, from French cuisine to diner favorites. Set on the popular Bávaro Beach on the Dominican Republic’s northeastern coast, lies Punta Cana Princess All Suites Resort & Spa. This adults only vacation spot boasts an excellent location and offers plenty of things to do for travelers. Take a dip in one of the four swimming pools or take the chance to explore waters sports which include windsurfing, kayaking, scuba diving and snorkeling. You also have your choice of three tennis courts then you work on your aim and shooting skills with a game archery. Enjoy dining at your choice of five restaurants, which includes an all-inclusive buffet or devour varied local and international cuisine. 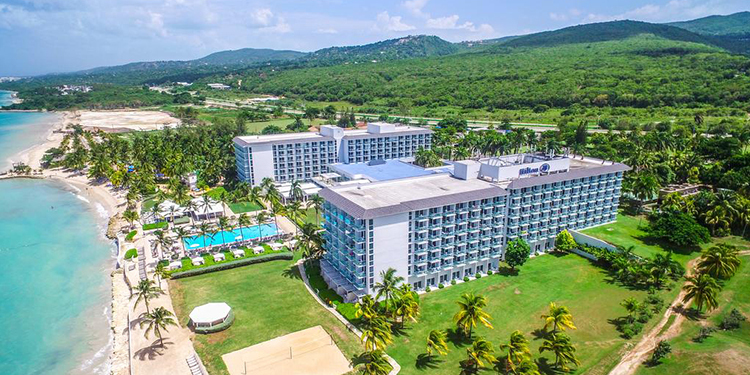 Escape to an all inclusive getaway at Jewel Runaway Bay Beach & Golf Resort then be surrounded by Jamaica’s lush foliage, scenic views and exotic adventures. This spot offers so much to do, which makes it any easy choice for our listing of the best Caribbean all inclusive resorts for Easter. Start by making a splash at the Jewel Lagoon Waterpark or tee off at the 18-hole championship golf course. Land and water sports are plenty here. Enjoy a game of tennis, set or match in the morning or evening thanks to the well-lit courts open any time. Explore a whole new exotic world underwater and explore oceanic treasures of all kinds with the Discover Scuba program. Try dining for all tastes seven casual and formal restaurants serving delicious cuisines from around the world. Set on a peninsula surrounded by the colors of the Caribbean, Secrets St. James Montego Bay offers adults the pinnacle of relaxation and romance and all the privileges of unlimited luxury. There is so much to see and do at this Secrets location, that we simply cannot list them all. Land sports include; horseback riding, cooking classes, dance classes, volleyball, and includes a jogging trail that’s great for bike riding. Water sports are also very abundant; try a catamaran sailing, scuba diving, sailboating, kayaking, windsurfing and snorkeling. You can tee off at the five most challenging golf courses only located a few minutes away from the resort. Choose from seven á la carte gourmet restaurants, a buffet venue, a grill and a café at this awesome location. The Hard Rock Hotel & Casino Punta Cana is a massive beachfront location that sits on one of the most gorgeous locations in the Caribbean. This minute you arrive in the lobby, be greeted by a large collection of rockstar paraphernalia. If you like to press your luck, this rock ‘n roll hotel features the largest casino in the Dominican Republic including 450 slot machines and over 40 gaming tables. If golf is your forte, play a game on the Jack Nicklaus designed 18-hole golf course. This resorts shines with your choice of 13 outdoor pools, four swim-up bars and three kids pools with fun waterslides. Take you choice of 13 dining options or have a drink at any of the 23 amazing bars which include a nightclub. Yep, this is why it ranks so high on our list of the most awesome Caribbean all inclusive resorts for Easter! 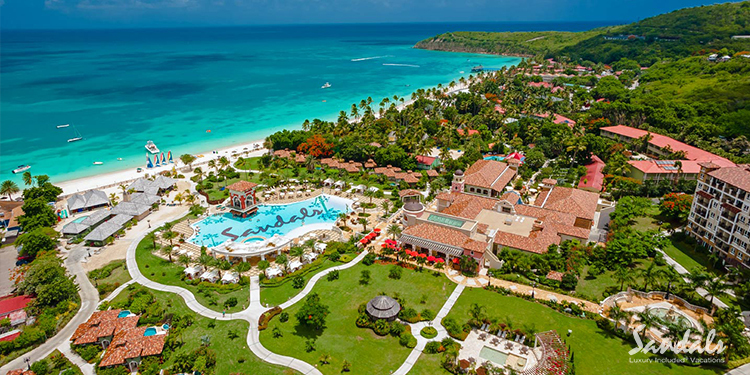 Picture yourself in the tropical island paradise of Sandals Royal Caribbean; which ranks the highest for Sandals on our list of the Caribbean all inclusive resorts for Easter. This exotic location features it’s very own private offshore island and spectacular over-the-water villas. Take a swim in any of it’ seven pools, including one with a swim-up bar. In the water or on dry land, there’s something for everyone here. Find plenty of land activities or take advantage of an array of water sports including canoeing, waterskiing, aquatrikes, tubing, paddle boarding or take a dive into the Caribbean and participate in snorkeling and scuba diving. Experience eight gourmet restaurants showcasing diverse cuisines from around the globe or have a few drinks at the five full-service bars including a British pub. 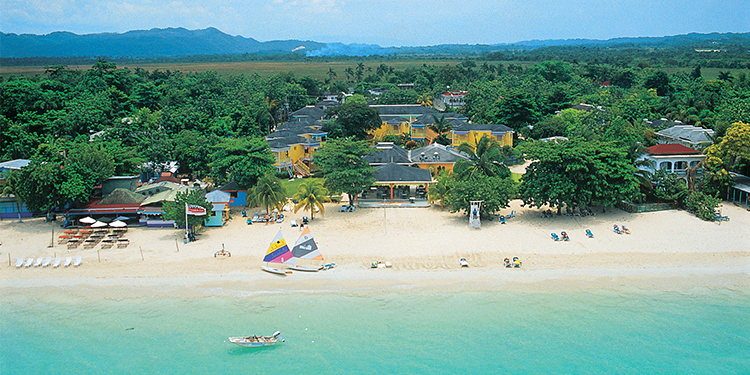 Runner ip to our list of the best Caribbean all inclusive resorts for Easter, is Santa Barbara Beach & Golf Resort. It rests on a nestled beachfront on the Caribbean sea within a 2,000 acre slice of paradise. Bask in the sun while enjoying a refreshing cocktail, before taking a dip in the refreshing cool water of one of the three pools. Discover miles of hiking and biking trails to explore on location that features breathtaking rock formations, beautiful caves and caverns. This hot spot also offers a variety of watersports rentals and tours allowing you to explore the Caribbean Sea and Spanish Water Bay. Play a match, practice your serve, or take lessons at their tennis facilities. Golfers will absolutely love the 18-hole, par 72 golf course with stunning ocean views. From gourmet Caribbean seafood to decadent burgers, you’ll find something to satisfy your palate from any of the four dining options. At the top our list of the best Caribbean all inclusive resorts for Easter, is the Hilton Rose Hall Resort & Spa. It is nestled between the scenic mountains and turquoise Caribbean waters of Jamaica. This beachfront location on the edge of Montego Bay takes the prize for the largest resort beach in Jamaica. Highlights include an ocean-view swimming pool and massive Sugar Mill Falls Water Park complex where you can navigate through cascading waterfalls. 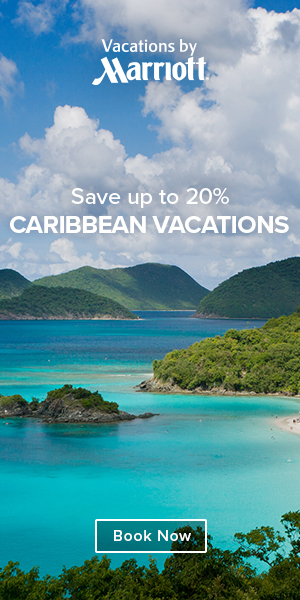 Take your choice of snorkeling in turquoise Caribbean waters, kayaking along the surf or sail into the horizon. Get unlimited green fees at the neighboring White Witch and Cinnamon Hill golf courses. This Hilton also features an array of distinctive dining options that is sure to satisfy any palate and preference. 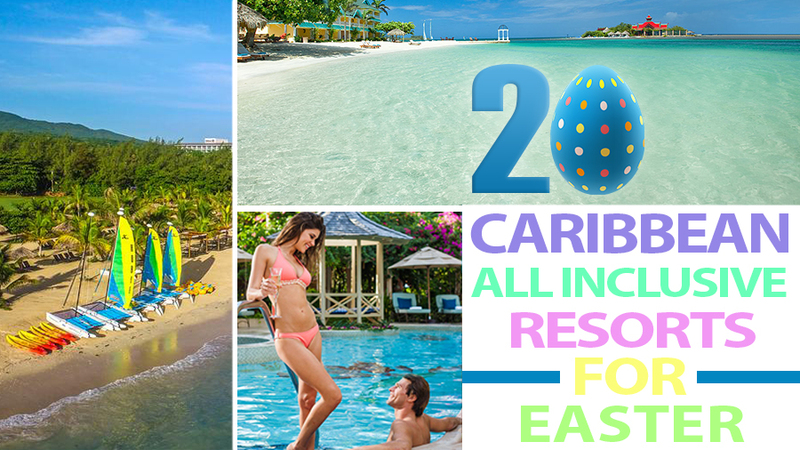 We hope you enjoyed our list of the Top 20 best Caribbean all inclusive resorts for Easter. We hope you have an amazing getaway at any on of this top rated resorts!